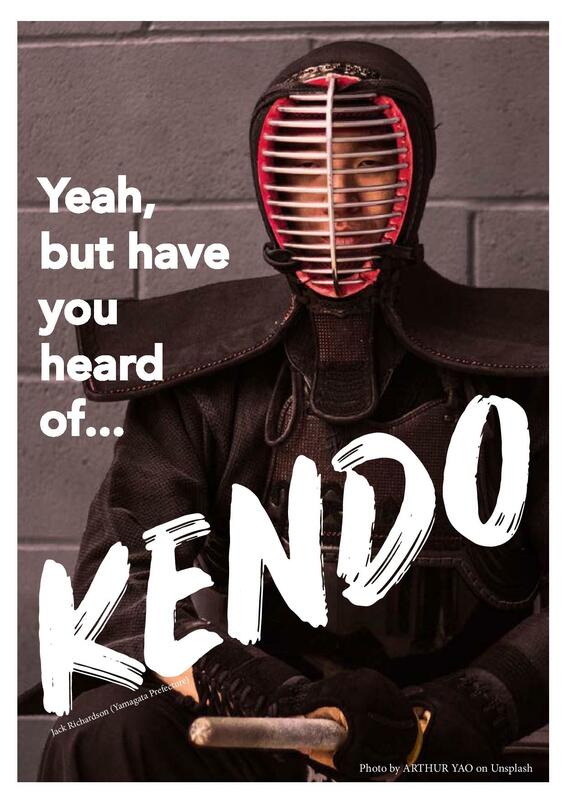 Yeah But Have You Heard Of… Kendo? OK, so you probably have heard of it. Or, at least, you’ve probably heard of it. Kendo is not renowned as the quietest or calmest of pursuits. But deep down below all that screaming and hitting and stamping lies a practice that is meditative, disciplined and suited to just about everyone. It isn’t too difficult to work out where kendo has its roots. Swords have been used in Japan since the fourth century, and the training with them is known as kenjustu. That’s ‘sword art’ or ‘sword technique’ rather than kendo’s ‘way of the sword,’ but kendo isn’t on the scene just yet. The first kenjutsu schools still in existence were founded in the Muromachi Period, from 1336-1773. These are the ancestors of kendo, and focus specifically on using swords in war and combat. Kendo, on the other hand, is, and has always been, a sport that’s strongly influenced by its martial art heritage. It’s similar to Western fencing in that regard — it has similar techniques, vocabulary and history, but no-one practices fencing so they can learn to skewer opposing noblemen with rapiers. As such, kendo adds formality and rules on top of already very formalised samurai duelling, as well as armour and swords that won’t slice you in half. There are two sides to kendo as it’s practiced today. One is kata (‘forms’). Kata are common in many martial arts, and in kendo are practiced without full armour using solid wooden swords called bokken, which are meant to imitate katana. 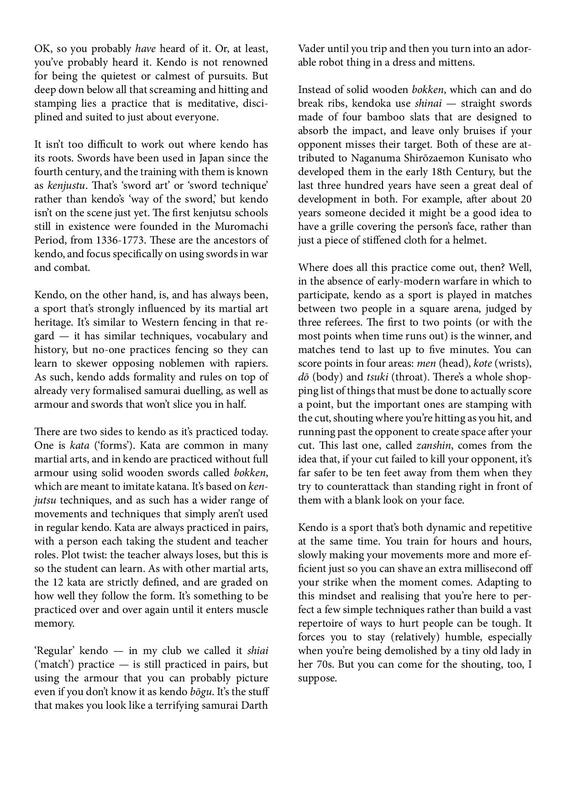 It’s based on kenjutsu techniques, and as such has a wider range of movements and techniques that simply aren’t used in regular kendo. Kata are always practiced in pairs, with a person each taking the student and teacher roles. Plot twist: the teacher always loses, but this is so the student can learn. As with other martial arts, the 12 kata are strictly defined, and are graded on how well students follow the form. It’s something to be practiced over and over again until it enters muscle memory. ‘Regular’ kendo — in my club we called it shiai (‘match’) practice — is still practiced in pairs, but using the armour that you can probably picture even if you don’t know it as kendo bōgu. It’s the stuff that makes you look like a terrifying samurai Darth Vader until you trip and then you turn into an adorable robot thing in a dress and mittens. Instead of solid wooden bokken, which can and do break ribs, kendoka use shinai — straight swords made of four bamboo slats that are designed to absorb the impact, and leave only bruises if your opponent misses their target. Both of these are attributed to Naganuma Shirōzaemon Kunisato who developed them in the early 18th Century, but the last three hundred years have seen a great deal of development in both. For example, after about 20 years someone decided it might be a good idea to have a grille covering the person’s face, rather than just a piece of stiffened cloth for a helmet. Where does all this practice come out, then? Well, in the absence of early-modern warfare in which to participate, kendo as a sport is played in matches between two people in a square arena, judged by three referees. The first to two points (or with the most points when time runs out) is the winner, and matches tend to last up to five minutes. You can score points in four areas: men (head), kote (wrists), dō (body) and tsuki (throat). There’s a whole shopping list of things that must be done to actually score a point, but the important ones are stamping with the cut, shouting where you’re hitting as you hit, and running past the opponent to create space after your cut. This last one, called zanshin, comes from the idea that, if your cut failed to kill your opponent, it’s far safer to be ten feet away from them when they try to counterattack than standing right in front of them with a blank look on your face. 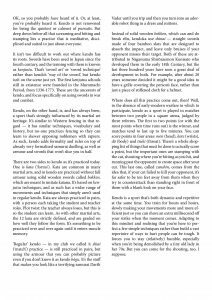 Kendo is a sport that’s both dynamic and repetitive. You train for hours and hours, slowly making your movements more and more efficient just so you can shave an extra millisecond off your strike when the moment comes. Adapting to this mindset and realising that you’re here to perfect a few simple techniques rather than build a vast repertoire of ways to hurt people can be tough. It forces you to stay (relatively) humble, especially when you’re being demolished by a tiny old lady in her 70s. But you can come for the shouting, too, I suppose. ← Family Spotlight: Winter Holiday Fun!